We’d love your help. Let us know what’s wrong with this preview of Sarah Morris Remembers by D.E. Stevenson. Sarah tells of her happy childhood at the Vicarage. The Morris family is full of life and individuality: Lewis, handsome and brave, Willy, less fortunate, and Lottie with her flaxen curls, who takes what she wants from life regardless of other people’s feelings. Gradually Sarah’s world expands as her brothers grow up and bring back friends from Oxford—among them Charles, the charming yet slightly mysterious Austrian to whom she is strangely drawn. D. E. Stevenson (1892–1973) was a Scottish author of more than 40 light romantic novels. Her father was the lighthouse engineer David Alan Stevenson, first cousin to the author Robert Louis Stevenson. To ask other readers questions about Sarah Morris Remembers, please sign up. There is a very moving scene where someone close to Sarah dies and I found myself crying (rare for me!) at the holy death of this character...for ultimately, I love Stevenson because she loved God...this love permeates all her novels! I liked this much more than I thought I would! Sarah Morris is a really sweet, sweet girl, but her story is not saccharine. I found her values to be an intrinsic part of her personality. In todays world where it is common to see the "me first" thought process and the instant gratification, Sarah exhibits kindness and generosity, perseverance and loyalty, while living through the London bombings of WWII. I definitely will read the sequel! Loved this book! D.E. Stevenson has done it again for me! Sarah Morris is the daughter of an English vicar. She has two brothers, Willy and Lewis, and another sister Charlotte, the youngest in the family, and *quite* spoiled! Written in pre-World War II, the novel progresses and takes the reader on a quick trip through the war from Sarah's perspective. We see Lewis wanting to be a soldier and Willy, much to his shame,exempted from service. Charlotte becomes more and more flighty and self-absorbed Loved this book! D.E. Stevenson has done it again for me! We see Lewis wanting to be a soldier and Willy, much to his shame,exempted from service. Charlotte becomes more and more flighty and self-absorbed, influenced by her shallow friends, the Meldrum family. How do two sisters in the same family turn out so differently? Lottie and Sarah are as different as could be... but the reader almost has to laugh at Lottie's immature actions. There is a vacation trip to Sarah's grandparents in Scotland, with more interesting and quirky characters to meet, and Sarah's horizons are widened when she meets her brother Lewis' schoolfriend, Charles. "When I went back to Austria, I felt frustrated. I felt like a fish out of water; I couldn't breathe freely. Then came the Anschluss when Austria was betrayed by her government and surrendered without a blow! That decided the matter; I couldn't live in a country dominated by a man like Hitler." "What do you mean, Charles?" I asked in surprise. "My mother was a MacDonald, as you know, so already I am half British by birth. I want to become a British subject. I have been in touch with the authorities and have applied to be naturalised..."
Sarah eventually finds herself caught up in a relationship that cuts across two countries at war. How Sarah copes with night bombings of London, is offered and maintains a job, and cares for her father and brothers during the war, (and the selfish vagaries of an annoying sister), is a very interesting read! "One day when we were in the garden, Grandpapa said something which made such a deep impression upon me that it affected my whole life… and even now, many years after, I can still see him sitting on the garden seat with the September sunshine falling through the leaves of the apple tree and making a sort of halo of his thick white hair. It was a Sunday afternoon. The grans had been to church in the morning, but they had left me at home because I was still in quarantine. The sermon had been about ‘the lilies of the field’ and Grandpapa had disapproved of it. “Lilies don’t have to toil and spin, they’re just beautiful,” I had pointed out. One of my favorite D.E. Stevenson books. Sarah grows up in a small town in Britain. Her college age brother brings home an Austrian student who loves the freedom of Britain at a time when Hitler is beginning to overrun Europe. Sarah pledges her allegience to him as he returns home to Austria at the beginning of WW II. Charles disappears for many years and she prepares to live her life without him. One day at work, she sees him again and he rushes away from her. What has happened to Charles? The s One of my favorite D.E. Stevenson books. Sarah grows up in a small town in Britain. Her college age brother brings home an Austrian student who loves the freedom of Britain at a time when Hitler is beginning to overrun Europe. Sarah pledges her allegience to him as he returns home to Austria at the beginning of WW II. Charles disappears for many years and she prepares to live her life without him. One day at work, she sees him again and he rushes away from her. What has happened to Charles? 3.5 stars. I found the beginning just so boring that I almost gave the book up. I suppose Sarah Morris's childhood memories weren't all that interesting. But after a while, I recognized D.E. Stevenson, an author I usually love. 2.5 stars. D E Stevenson is an author I usually love, but this is certainly not one of her best novels. I got bored several times and couldn't feel empathy for the characters. Pity. I loved this book. Entertaining, relaxing, easy reading. This is the kind of book I was ready for~ after reading several other books that were hard work, and one that bored me to the point that I gave up. This was a book I may read again in a few years~ just for fun. Also, it may encourage me to write my own memoirs. Story of the first 20-some years of Sarah Morris. Enjoyable writing and very likeable characters for the most part, although right in the middle is a bit of implied immorality that quite disappointed me. It's not spelled out, and is never referred to again. As a young teenager, Sarah meets her older brother's college friend, a kind and sympathetic man from Austria named Charles, and while he retains family-friend status for a while and she has a childish affection for him, it's not much of a leap Story of the first 20-some years of Sarah Morris. I love the books by D.E. Stevenson! Charming stories of ordinary people, with enough of an edge to keep them from being saccharine and too sweet. SARAH MORRIS REMEMBERS might be considered a period piece. Sarah's mother seems almost child-like in her determination to make life fit her script; she is frightened by any idea beyond her own narrow horizons. Sarah and her father quietly work to protect her, but her death and the war sets them on their own paths. Both of them grow stronger in what t I love the books by D.E. Stevenson! Charming stories of ordinary people, with enough of an edge to keep them from being saccharine and too sweet. SARAH MORRIS REMEMBERS might be considered a period piece. Sarah's mother seems almost child-like in her determination to make life fit her script; she is frightened by any idea beyond her own narrow horizons. Sarah and her father quietly work to protect her, but her death and the war sets them on their own paths. Both of them grow stronger in what they experience, as does the younger of her brothers, Willy. The love story of Sarah and Charles is notable mainly for her steadfastness. She never deviates in her love, even as he falters through a misunderstanding. Reading D.E. Stevenson has always been a delight, and I've collected a shelf full of her books. But to discover a new (to me) book on Kindle was an unexpected treasure! Fortunately I was also able to purchase the sequel to this book on Kindle, so will hurry off now to begin that. I'm glad to recommend her books, I've never read one that I didn't enjoy - in the over 55 years I've been reading! I am a D.E. Stevenson fan, and have read many of her books. This one just moved too slowly for me, went on too long, and had subplots and characters that didn't go much of anywhere. I know it's structured as a diary, but it doesn't sound like one. In the end, the only thing I cared about was whether Sarah and Charles would ever get back together and I would have been happy if someone had tapped me on the shoulder and said: "Oh, I read that book. Let me tell you how it ends." This review has been hidden because it contains spoilers. To view it, click here. I didn't like this book as much as most of hers. I didn't like the hero as much as most of her books; the fact he fell in love with her when she was still basically a little girl was a bit weird, and we never even know how much older than her he is. He seems a bit unformed. The WWII parts were interesting, though. D. E. Stevenson has been a favorite for many years. I thought I had read them all but Sarah was a new acquaintance for me. Set in the prewar and war years England and Scotland the book tells the story of a young woman's life as she journaled it. A satisfactory story. Revisited this book after an absence of many years and loved it just as much as I did the first time! Another lovely story by DE Stevenson. She doesn't give her heroines an easy time but it always works out for them. Interesting perspective of WWII. This book took me back to my own childhood and I so enjoyed it.Shades of my own Mother and family. Very enjoyable in a gentle way. 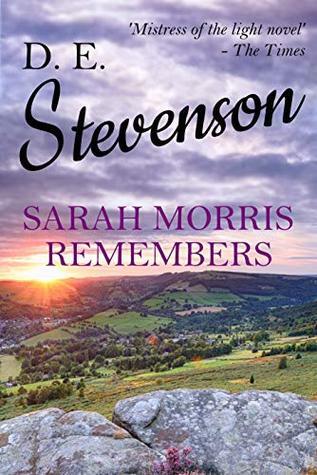 SARAH MORRIS REMEMBERS (SMR) is a quiet novel, not a gripping page-turner, not filled with rich Dickensian characters, not even crafted with clever plot twists or a shocking denouement. SMR is, however, refreshingly genuine and believable. I get the feeling that D.E. Stevenson wrote this book lovingly, pouring a great deal of her own heart into its making. It's a fictional memoir, based on the diaries of a young Engllishwoman too young to have appreciated the horrors of the Great War, young enou SARAH MORRIS REMEMBERS (SMR) is a quiet novel, not a gripping page-turner, not filled with rich Dickensian characters, not even crafted with clever plot twists or a shocking denouement. SMR is, however, refreshingly genuine and believable. I get the feeling that D.E. Stevenson wrote this book lovingly, pouring a great deal of her own heart into its making. It's a fictional memoir, based on the diaries of a young Engllishwoman too young to have appreciated the horrors of the Great War, young enough to experience her first true love in the midst of World War 2. I'm sad that I've finished the book. Just a nice story of a British family in the years before and during WWII. Would love to see a reprinting of the authors works - too pricey to buy and hard to get through the library (and we have a great system libraries in the area). Love me some DE Stevenson. This was my second read and I did enjoy it. Nice story but not as good as some of my favorites like “Celia’s House”. This book started slow but ended up being another delightfully old fashioned D.E. Stevenson story. Such a sweet coming-of-age story. It didn't have the humor of the Miss Buncle books but it had more depth. How fun to find some more Stevenson at the library! three and a half stars. Just really good, summer/comfort/deck/in the sun/reading late in bed book. Full name: Dorothy Emily Stevenson. D.E. Stevenson had an enormously successful writing career: between 1923 and 1970, four million copies of her books were sold in Britain and three million in the States. Like E.F. Benson, Ann Bridge, O. Douglas or Dorothy L. Sayers (to name but a few) her books are funny, intensely readable, engaging and dependable Full name: Dorothy Emily Stevenson.